A loose and comfortable cargo short with belt is ready-to-wear style. 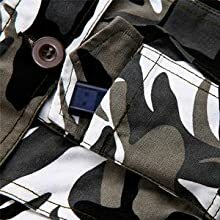 Twill cotton camo Pattern cargo pockets shorts match with white classic T-shirt is really cool in hot summer. 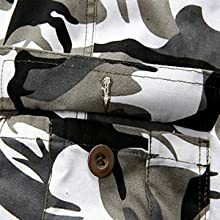 This short is designed with utility and offers multiple pockets, this is the classic cargo style. 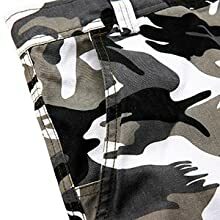 All pocket flaps on this cargo short are reinforced and secured with buttons or snap. Loose fit but with enough room to carry your stuff. Utility pockets for outdoor essentials,slide deep slant pockets with sewn edge prevent things from falling. Side slant pockets with small triangle patch to keep things. 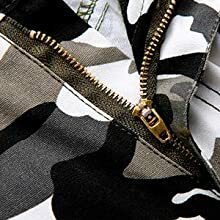 Side multiple size cargo pockets. Small cargo pockets for all things you need.